The girls were so excited to see daddy (Clayton) when they woke this am. 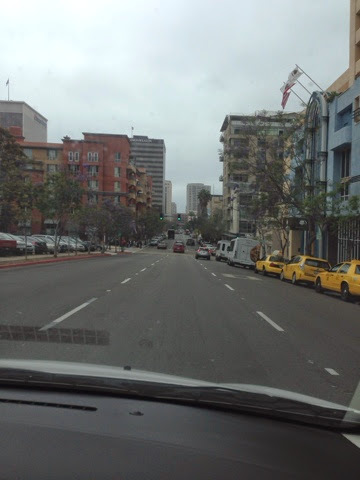 Last night Denise and I stayed home with the girls when Dana went to get Clayton at the San Diego Airport. Clayton woke us when he got home about 12:30 am. His flight was somewhat delayed. 8 months being away is a long time and Denise and I were happy that clayton got off the ship in Hawaii and flew home bringing him home about a week early. After a lazy morning we head out in their Mazda Wagon that fits us all (4 adults and two children) in one car to downtown Dan Diego. 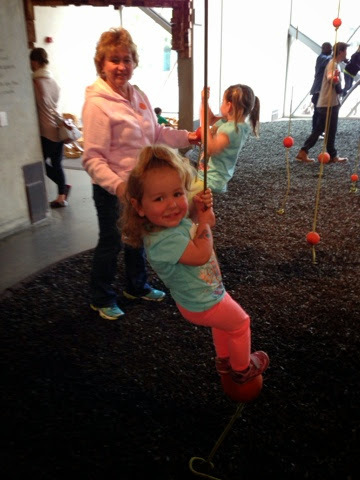 We took the girls to the Children's Myseum where they got to do many interesting things, like hanging on ropes in an area that manipulates sound. I called my mom as she returned home yesterday, having flown home from Florida. It was back in January that I drove her to Florida as part of the first phase of my travels for her to be with her sister. After playing around with the girls at the museum we head over to Seaport Village for lunch. 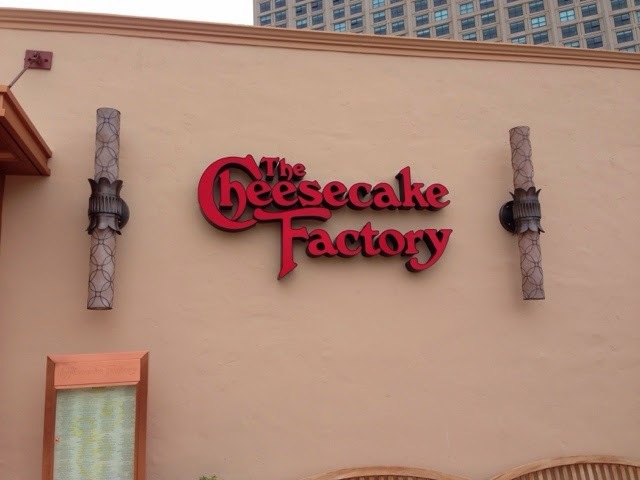 We chose the Cheesecake Factory where the food was good but I would say the service was poor putting it at 2 out of 5. 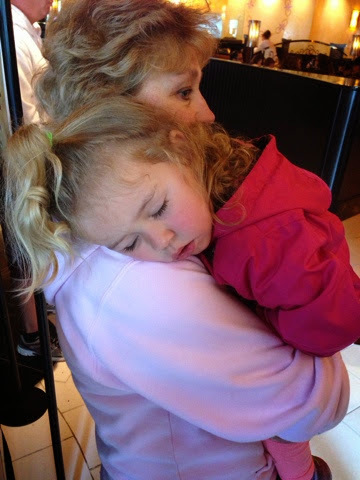 Taylor was worn out and slept through the wait to be seated and the whole painful ordeal of poor service. I gave a 2 out of 5 got as they got the wait time and seated us, asked and delivered drinks, took our food order all in a reasonable time. Even the appetizer that Clayton ordered came in a reasonable amount if time. After this point they must have lost all focus on "us" the customer. The biggest issue was that our entrees didn't come and didn't come and didn't come. The wait staff was nowhere to be seen during this time either. When our waitress finally came by and gave us the bad news she left us with the impression that our food would be out shortly and it wasn't to be seen then. Denise asked for a water and then reasked and then had to wait for a long time to get it. Finally, 2 entree's came out and then there was a pause and two more came out. Then it was awhile for Madison to get her pizza entree. None of us were in any rush so it didn't affect our our day. The experience does go down in my book for the top poor service I have ever received at a restaurant. Just so you know we arrived about 1:00 pm and had a 15 minute wait to be seated as it was crowded. The restaurant was about half full when we left 1.5 hours later. I personally think they lost track of our order in the kitchen and it the waitress addressed it after figuring out we had been waiting so long. For a chain restaurant this is a very big failure. Something like this happened to Denise and I a few years ago at Olive Garden in Keene, NH. When I complained to the manager at that time they took one meal off the bill. My biggest issue when somwthing like this happens is that they are not forthcoming to the customer. When they don't keep the customer informed I feel that they are disrespecting the customer. Customers are more intelligent than the way they are treated. The wait staff is responsible to manage the customer's experience and they just don't in these cases. I just can't believe how poor the service was for a major restaurant. After we left we took a trip back to the house for a short while then we went back out to Mission Bay Park, as Clayton wanted to take a run and we got to play with the girls on the playgrounds. Then a stop at the grocery store for some items and then home for dinner. Clayton needs to move next month to Monterey, CA as his next assignment is to go to the Navey College there to get his Masters in Computer Science in two years. We are happy for him and we look forward to our adventures around that area of the state during our visits.